The artist's family; by descent to Mrs. Fleetwood Walker, England; by descent to Mr. and Mrs. G. L. V. Walker, England; (P & D Colnaghi, London); (Spink-Leger, London). Exhibition of Drawings and Watercolours by Cornelius Varley, P & D Colnaghi & Co. Ltd., London, 1973, no. 16, pl. 10. Feeling Through the Eye: The "New" Landscape in Britain 1800 - 1830, Spink-Leger, London, 2000, no. 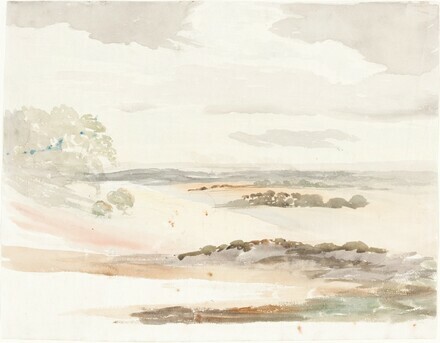 90, as Open Landscape with distant hills, Shropshire.